My wife Ira is from Russia and due to her god-fearing babushka, she was baptized in secret as a baby during the communist regime. Ira grew up in the Orthodox faith. My coming to Orthodoxy came much later in my life after time spent in Russia but then really discovering Orthodoxy here in America at Holy Theophany Church. I grew up in a non-denominational Christian home. My parents were introduced to Christ and were baptized in Costa Rica when I was three years old and so I was brought up in the Christian faith. My dad is a godly man who raised me up to have a Christ-centered, biblical worldview and he taught me how to pray. I’m very thankful for this upbringing and it definitely set me on a good course in life. While I was a young teenager I was very involved in my youth group. I got connected with a group of friends with whom I would remain deeply connected with and serve the Lord together with them. We pursued God and a life of ministry together. We did youth ministry and traveled to Russia to do orphan care ministry with a grouped called Children’s HopeChest. It was on my first trip to Russia in 1997 where I was first introduced to the Orthodox Church. I didn’t know anything about Orthodoxy but Children’s HopeChest taught us that the Orthodox Church was the Christian church of Russia and it should be respected. I found these Russian churches I visited to be fascinating yet I didn’t really grasp what was there. I thought the sounds we beautiful, the iconography was beautiful, but I certainly didn’t get it. It was interesting and I liked it, but it just wasn’t for me. Back home in Dallas, Texas my Christian community and I eventually started our own church. We started a “youth church” for high school and college students and we lived and breathed that ministry for about 3 years. We were honestly searching for something bigger to be a part of but we just couldn’t find it so we tried to make it up on our own. We were learning about early church traditions so did things like burn incense, light candles and serve communion. Little did we know how we were actually reaching out for the traditions of the Orthodox Church. At 21 I moved to Colorado Springs and pursued working in the video production industry. It was my first job outside of church work. I was kind of tired of church work in fact. I just didn’t want to do it anymore. In fact, I didn’t even go to church at all for quite awhile even though I never gave up on my faith. It was just “me and Jesus” and I thought I’d be happy that way. Well, I wasn’t. I knew there had to be more to life, faith and the church than just me and Jesus. During my many trips to Russia I met and fell in love with Ira who worked for Children’s HopeChest as a translator. We met in 1999 and she has now been my wife since 2003. She grew up Orthodox in Russia and it was dear to her, but she didn’t necessarily have a solid formation of her faith and the traditions of the Church. When she first came to the States, I was visiting a non-denominational protestant church in town and she’d go with me. I thought it might be cool for us to go visit the Orthodox Church sometimes as well. We started visiting here at Holy Theophany and after a few weeks of hearing the services in English (I had previously only seen Orthodox services in Russian), I started to hear some things that I really responded to. Initially I had the misconception that Orthodoxy was about tradition and not scripture. Well, I heard scripture being read. In fact, I heard a lot of scripture being read at every service. I heard more scripture in one Divine Liturgy on Sunday morning than I had heard in months of services combined at previous churches I had attended! I loved the liturgy, the teachings, the focus on living a life of humility and of love; love of God, love of neighbor and even love of my enemies. Christ’s Gospel was proclaimed and Christ was the center of the worship, culminating with communion to partake of His holy body and blood. I was blown away by the richness and depth of what I experienced and began to learn. One thing that our priest Father Anthony said to me early on was “come and see.” Just come and see the church. Hear the music, listen to the words, and participate in the worship. And so I did just that. And the more I came, the more it made sense and the more I embraced it, the more it began to change me, to bring me closer into a right relationship with Christ. After a few months I became a catechumen in the church. During my 6-month time as a catechumen, I went through an intro to Orthodoxy class with Fr. 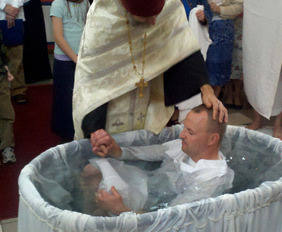 Anthony and then received holy Baptism into the Orthodox Church in September 2004. My wife Ira was along side me in this journey. She was learning with me and lovingly encouraging me the entire time. It has been great for us and for our marriage to be joined together in the same Church. We have truly found our home here. I’m very grateful for my early years of faith. It introduced me to Christ and gave me a good foundation for my life. In the Orthodox Church, I discovered this rich heritage that I never knew existed before. Initially I had met Christ, but now in Orthodoxy I met the rest of His family, including His Mother. As well as I was introduced to the great cloud of witnesses who came before me; the great martyrs, the holy saints, the keepers of the Holy Tradition. In Orthodoxy I’ve discovered that there is more to my faith than just me and Jesus. I do have a personal relationship with Christ, but it’s not individualistic. It must be experienced within the context of the Church, that greater body of Christ. I have a biblical worldview, but my biblical interpretation does not come from what makes me feel good, by modern trends, by currently political issues, or by how I choose to interpret scripture. My biblical understanding comes through the framework of the Holy Tradition of the Church, which has been preserved and passed down throughout the ages. I began to think back throughout the years and see how God had been tracking me down. The first year I went to Russia, the teacher I worked with gave me a little icon book of Mary, Christ and St. Nicolas. He told me to keep it for protection. I gave him a What Would Jesus Do bracelet back. Oh well. I still have that little icon and I carry it with me in my computer bag wherever I go. I bought an icon of Christ on my second trip because I thought it was cool. That icon is now in my icon corner at home where I pray. The first gift my wife gave me when we first met in 1999 was an Orthodox cross. It eventually became my baptismal cross and I wear it to this day. Years ago I bought the book “The Way of the Pilgrim” because it was a Russian classic. I had no idea of the true treasure of Orthodox spirituality that was in that book. There are countless things throughout the years where I can look back and see the slow work of God in my life to bring me closer to Him and into the fullness of His Church. 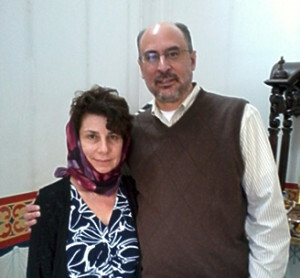 Wayne and Grace were brought into the Orthodox Church on Holy Saturday of 2011 after attending Holy Theophany for the previous year. They have lived in Colorado Springs for their whole married life, from 2000 to the present, and have two girls, Miranda and Kitty. Wayne is an aerospace engineer and Grace homeschools the girls. They took diverse paths to the Orthodox Church, but both view the Church as the fulfillment of their earlier faith. Wayne grew up in eastern Washington state and attended Washington State University, where he became an Evangelical Christian. He then joined the Air Force and ended up here in Colorado Springs. Grace took a more circuitous route here. Her family is originally of Palestinian origin (her parents are from Jerusalem) and she grew up in Lebanon and England before moving to the United States in the late 1970s. She attended the College of Notre Dame in northern California, majoring in English, before working on Muslim outreach for a mission in Germany and then at a newspaper back in the U.S. Grace was raised an Evangelical, but, given her family’s Middle Eastern origins, she was exposed to Orthodoxy from her youth. 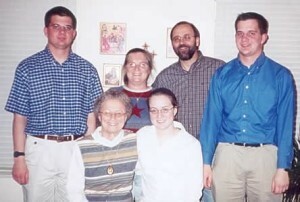 Given Grace’s background, the Yennes’ conversion to Orthodoxy begins, in a way, with her youth; however, their adult journey to the Church began shortly after they were married. Before coming to Holy Theophany, they attended a Presbyterian church whose pastor had an appreciation for Eastern theology and they would also read some books on their own. In addition, they would try to plan what they call a “Family Field Trip” every few years to examine churches. 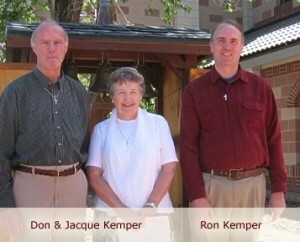 Their specific journey, here, though, began in earnest during Holy Week of 2010. Wayne and their daughters were involved in a buddy basketball team with the Morrisons and Battersbys, and once he discovered the connection to Orthodoxy, he tried to find a time for their family to visit. Wayne says he still has the emails he traded with Jeff Morrison in which he stated his family wanted to come visit but they were “not looking to switch” churches. Their first service was Matins with Lamentations at the Tomb on Holy Friday evening. Wayne describes the experience as being disorienting, but he liked it, while Grace says she felt comfortable and “at home.” While the Yennes were not looking to switch churches, after that first service, they couldn’t stay away. Within a month or two, Wayne and Grace had decided they wanted to stay at Holy Theophany, become Orthodox, and raise their children here. In addition to the explanations of beliefs and their experiences of the Church, they give the human connection they feel here as a main attraction. The fellowship lunches, the time the people here spend to talk and laugh with each other, and the general feeling of interconnectedness are all hugely important. Grace explains that she feels we lack a sense of true connection here in the West, and Holy Theophany supplies that. They feel it so much that, once they had their first taste of life here, they had to stay, and they’ve been here ever since. 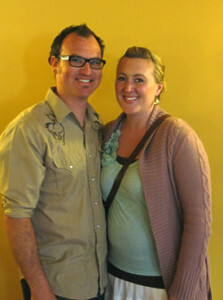 Protestant Church Worker goes "East"
Jason and Kristin moved to Colorado Springs from California in March 2010, after being married in Feb of that year. They both grew up in California and attended Christian colleges there, where Jason majored in Biblical Studies with a concentration in the Jewish roots of Christianity and Kristin majored in Vocal Performance with a concentration in Opera. Jason is currently a flight attendant for SkyWest Airlines and Kristin is getting ready to begin offering music lessons from their home. When they moved here from California, the Parks started checking out some of the local churches, but couldn’t find one that fit. They had attended an evangelical church in California, and started looking for one here, but eventually found themselves at Holy Theophany, and haven’t left. As for how they even knew to look for an Orthodox Church, they each took quite different paths. Jason was first introduced to Orthodoxy on a trip to Ethiopia, where he was able to see and experience the Church there, while Kristin has a friend back in California who is an Orthodox convert and was encouraging her to “come and see” what the Church has to offer. Finally, after trying out a few other churches, they looked us up, and are now catechumens. Given his Biblical Studies background, Jason appreciates the way Orthodoxy matches up with the Bible and history; Kristin says she values that the Church has a solid answer for any questions she might have. Because this took place at the home of St. Herman, it brought with it a perspective of what it means to be alive before the face of God. My past experience with spirituality notwithstanding, my time on Spruce Island will be with me always. Growing up in Texas, my mother gave me only the spiritual guidance in which she was grounded. Although not part of a church, she always read to me from children’s Bible story books and taught me to pray. I never forgot her lessons or the stories, but seldom remembered to implement their meanings and comforts. It was not until later that I realized their value in my life. When I was sixteen, it was a very good year. Twelve months attending a local church inspired me to quit public school and persuade my mom to let me attend a private Christian school, and I graduated in 1993 with great friends, a comfortable place in youth ministry, and a desire to serve God. Out of the said desire and a lack of knowing what to do, I followed my friends’ academic pursuits and attended Christ For the Nations Institute in Dallas, Texas. For two year, I studied the Bible, sang songs to God and wondered who was really on top of things in Christendom. It’s fair to say that this is also the time when I wondered who was really right in their respective take on God, the Bible, and especially on how to do church. Primarily, because they accepted my CFNI credits, I took my studies to Dallas Baptist University, as well as my persistent questions on what exactly I was learning. While at DBU, two major events transpired: an introduction to philosophy and my first trip to Russia. Still wanting to serve God yet having no clue as to what that would look like, I started taking classes from a philosophy professor. The classes were small, the content intense, and the teacher made everything interesting, all with a Christian perspective that was neither too Protestant nor enough Orthodox. During August, 1997, I went to Russia and worked in a summer camp for orphans. The experience forever changed me, and I came back to college with the need to understand what true Christianity is. Aside from a church visit in Suzdal, my first introduction was a textbook for a class on Christian worldview, For the Life of the World, by Fr. Alexander Schmemann. While going through CFNI and the university, I was interning at various youth ministries. There was a core group of us: young students, all involved with summer camps in Russia, and constantly searching for something deeper in God and church. I was particularly finding it difficult to be settled doing youth ministry with no vision beyond. Russia was always on my heart and I wanted desperately to go back and live among the orphans. Finally, I got my chance and moved to Kostroma in December, 2000. For all of 2001 I lived among the saints of Holy Rus’, the ancient monasteries and churches, and Orthodox believers. I came back to America with no interest in Orthodoxy. Therefore, my understanding of the Church was limited and stale. My disinterest, however, was not limited to Orthodoxy, but to any church of any confession. I, along with my transplanted friends from Texas, searched Colorado Springs for a place to worship God. Going hither and thither proved unfruitful, and with great reluctance I visited Ss. Constantine and Helen Orthodox Church. It was the beginning of Great Lent and I kept going back. Eventually, I told the priest, Fr. Anthony, that I was out of excuses and did not know what to do with myself. The next Sunday I became a catechumen and three months later I was on the church work trip to Kodiak Island in Alaska. I was able to go to Spruce Island and help restore Ss. Sergius and Herman chapel. While there, I drank from a supernatural spring, met and worked alongside the monks Fr. Andrew and Fr. Martyrios, and learned of the beloved St. Herman. 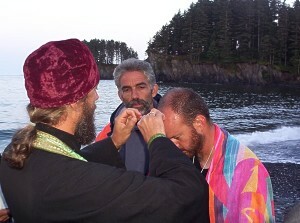 On July 12 (Old Calendar in Alaska) I was Baptized and Chrismated into the Orthodox Church in Monk’s Lagoon, the waters of the Pacific Ocean, receiving the Eucharist on Ss. Peter & Paul’s Feast Day. The desire to serve God never left me. Rather, it became more clear, as are most things since converting. Working in youth ministries and with Russian orphans, living in Russia, looking for churches – all of this led to something that God made clear at Ss. Constantine and Helen Church. Understanding who the Greek Fathers are, what icons tell me, how the Church formed and by whom, what the Bible is, reading account of Fr. Arseny and Elder Paisios – this is what my soul craves today. I want to learn more; I want God to make them clear. The Wednesday night classes at Ss. Constantine and Helen Church with Fr. Anthony, my first spiritual father in two decades of being a Christian, made me want to go to seminary more and more, to learn the truth of being alive and Christian. Today, I am in my second year at St. Tikhon’s Seminary. I would love to tell everyone that it has been a breeze academically and spiritually a cinch. Truth be told, I’ve never had to study so hard before, not for getting the grade, but studying in order to understand. What is more, any spiritual growth I have experienced has not come wrapped up in a pretty box with my name on it. The process of learning what it means to be humble and fleeing the passions has been the most difficult endeavor of my life. In the context of seminary, the thoughts of truly serving the Church are so much more real, more serious. This is good, for I have realized the importance of understanding and spiritual wisdom over good grades and snappy answers. One of Don’s greatest hungers was to find a church where worship of Christ our Lord was primary. Over the years we all had become dismayed how even the more conservative denominations were becoming more worldly and seemed to be focused more on the congregation and its needs rather than worship of the Lord. After flirting with godlessness, we both became Christian in our 20’s at one of Seattle’s growing mega-churches. We met at a single’s bible study, married a year later, had our first child a year after that and then headed out for Bible College. We spent the next ten years headed toward and living on the mission field. I completed Bible College while Carolyn raised kids. I pastored a small church and then served on the staff of several large and growing churches. After five years of preparation and fund raising, we moved to Istanbul, Turkey where we learned the language and did further preparation for our final target—Tashkent, Uzbekistan. Tashkent is the key to Central Asia and the capital city of the Uzbek people. As Tashkent went, so would go much of the 50 million unevangelized Muslims of Central Asia. We arrived in Tashkent one year after the Berlin wall fell, just as the Soviet Union was breaking up. We were among the very first western missionaries to live in Tashkent in almost 100 years. Carolyn’s health deteriorated in Tashkent and we eventually moved back to the States. Someone gave me a book to read on the long flight home—Becoming Orthodox by Peter Gillquist. On the face of it, the book seemed a crazy story. 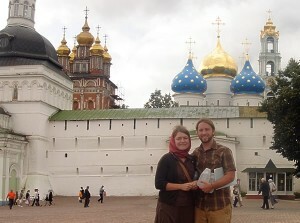 A bunch of Campus Crusade families had become Eastern Orthodox as a result of studying church history. Much of Gillquist’s persuasion left me cold, but one thing stuck. Gillquist challenged his readers to read the accounts of the early church fathers and compare the church they found there with the church in which they worshipped on Sunday morning. He said that an honest reader would find the church of the martyrs much more like an Eastern Orthodox Church and very much not like an American Evangelical church. I took him up on the challenge. Of course, Gillquist turned out to be right. During its first 300 years, the church turned out thousands of martyrs, conquered the Roman Empire from within and wrote extensively about her beliefs and practices. It is a church whose doctrines are confirmed by her history and made unassailable by her martyrs. How can a comfortable twentieth century Christian tell a third century martyr that his way of doing church is wrong? And the way the Christians did church in the age of the martyrs was distinctly Eastern Orthodox. These Christians had authoritative, hierarchal church organizations. They worshipped in a liturgical way and they were willing to give their lives for the real, sacramental presence of the body and blood of Christ in the Eucharist. The Eastern Orthodox Church claimed to be that same church of the martyrs, only grown and matured by the passage of time. In the same way that I am my parents’ baby boy grown to manhood, the Eastern Church claimed to be the church born of the Apostles, nurtured by the martyrs, trained by the ecumenical councils and grown to maturity by years of perseverance. I was fascinated and horrified both. If I really had stumbled onto the church as given to us by the Apostles, that would be an amazing gift from a merciful God. On the other hand, if the Orthodox Church was what it claimed to be, that would mean a tectonic shift in our life and family. I loved being a missionary. The church was the center of our family—it was the rock upon which our marriage was built. If the Orthodox were right, we would have to change everything that mattered in our lives: faith, church, marriage, family, friendships and career. The summary is that through a yearlong struggle, we managed to do just that. At times, Carolyn was sure that our marriage and family were going to break up. At times, we were all put off by the sheer Catholic-ness of the Orthodox Church. (If there is a foundational principal of popular Evangelical theology, it is that all things Catholic are wrong.) We had a tough time coming to grips with Mary. It took us a long time to appreciate the liturgy. Confession was terrifying and exhilarating. In addition to questions of faith and family, I had to find a new line of work. Ten years after the fact, our family is solidly Orthodox. The kids were part of the journey and choosing to become Orthodox is a significant chapter in their growth from childhood to adolescence. Carolyn and I are growing in the love of our youth. Carolyn is missing a lobe of her lung—the sickness that brought us back from Tashkent turned out to be lung cancer—but the doctors say all the cancer is removed. As it has been for our entire married life, the church is very much the center of our life. One last thing needs to be said. Many of our old Evangelical friends have great difficulty understanding our move to the Orthodox Church. They see the change as a rejection of the church that sent us to Tashkent and the friendships and prayers that sustained us there. That reaction is understandable but it is very different from our own view. We think of ourselves as having been given a chance to move from good to better. The Evangelical church is certainly a means of God’s grace. But our conclusion is that the Orthodox Church is more so. We do not think of ourselves as having moved away from the church so much as having moved to her core. If the cross of Christ is surrounded by concentric circles, then we have moved from a good circle to a better, and even closer circle. It makes sense that our change is hard to understand, but we very much appreciate the many Evangelical Christians that nurtured and prayed for us for many years. To all of you we say “Thank You” and invite you to take a closer look at historical Christianity in the Eastern Orthodox tradition.